Reality Check: Are 90% of Zimbabweans unemployed? There are a lot of figures for the rate of unemployment in Zimbabwe doing the rounds, from 95% to 5%, which is surely the biggest range you’ll see for estimates of any indicator. 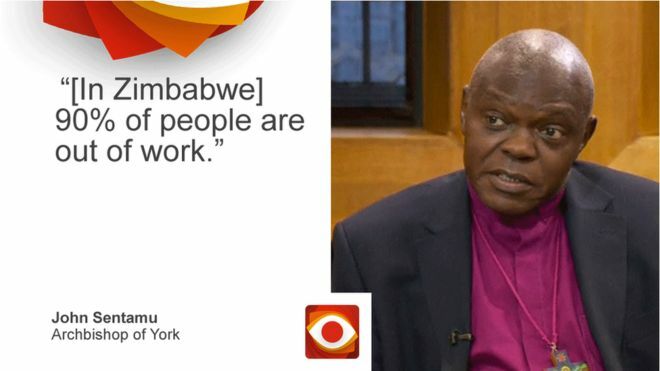 The Archbishop of York, John Sentamu, quoted a figure of 90% on the BBC’s Andrew Marr Show last week. So why is there such a range? It depends largely on what definition of unemployment you use. The most recent Labour Force Survey from the Zimbabwe statistics authority Zimstat covers figures for 2014. It gives the unemployment rate – that’s the proportion of people over the age of 15 who are available to work but are not working – as 11.3%. That’s not ridiculously high. The corresponding figure in neighbouring South Africa in 2014 was 24.9%. Zimstat told Reality Check that the reason the 2014 figures are relatively low is that they included people like subsistence farmers, who consume all their own output, as employed. Their rules have now changed and when they do their next labour force survey such people will be counted as being unemployed, which should lead to a sharp increase in the rate. Zimstat was supposed to be conducting another survey this year but “resource constraints” prevented that from happening. They now hope to conduct another one in 2018. There is an even lower estimate than 11.3%. The International Labour Organisation (ILO) calculated it at 5.2% for 2016. But that is a figure for strict unemployment, which means somebody must have been without work, available for work and actively seeking work. The broader definition does not require somebody to be seeking work. In the 2014 Zimstat report, the strict unemployment figure was 4.8%. The ILO used that figure and information about things such as company closures to come to a 2016 figure of 5.2%. The author is suggesting that 95% of the economically active people in the country are out of work. Where has this figure come from? Handily, the author links to the source of this data, an article in the New York Times. But the New York Times is clear that the figure it is citing is not the unemployment rate, it’s the proportion of people in the country who are working in the informal economy. It also comes from Zimstat’s labour force survey from 2014. People working in the informal economy include people working unpaid for a family business or paid employees who are not entitled to sick leave or paid holidays. It is an important metric and it’s extraordinarily high, but it’s not the unemployment rate. Even so, Prof Catherine Boone, from the LSE, confirms that the main distinction between very high and very low figures is how you treat informal employment. If the only people you count as employed are those on a payroll with taxes deducted at source and pension provision, then you get to a very high estimate of unemployment. Once you start getting into the informal economy though, things become less clear. So, for example, a consultant working part-time for various international organisations would not be considered to be formally employed by this definition but few people would consider him or her to be unemployed. The 90% estimate comes from the Zimbabwe Congress of Trade Unions – speaking after that estimate was made, opposition leader Morgan Tsvangirai said that President Mugabe had turned the country into a nation of street vendors. But are street vendors not employed? They can’t be if you are estimating a 90% unemployment rate. The ILO, which sets the rules for unemployment statistics, says that unemployment is certainly not as high as 90%, but confirms that it will be higher than 11.3% once subsistence farmers are reclassified. But it also says that the actual proportion of people employed is not what matters in Zimbabwe at the moment.